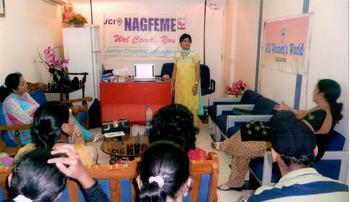 My first ZTWS ( Zone Trainer Work Shop) assignment was given to me by Dr Archana Jaiswal, President JCI Nag Feme. I conducted 3 hrs training program on ' Leadership in Action'. It was the first time i was really teaching some one as a trainer. The audience contained both house wives and working ladies (Its a ladies chapter). They were very enthusiastic about the session and the training program went very smooth. I planned an activity of making a kirana shop from sweet packets, chocolates, balloons, straws and pins. Very creative audience. Everyone was done with the shop after 15 minutes. Me and Archana had a difficult time selecting the best group. It was a very special moment for me because it was the fist time i was greeted as a trainer.